Introduction: In this study, we undertook a retrospective analysis of the epidemiological aspects and risk factors of murine typhus (MT) in Korea in the last decade (2006–2015). 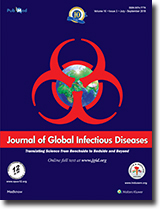 Materials and Methods: MT infections in Korea using a total of 411 cases obtained from the Diseases Web Statistical System of the Korea Center for Disease Control and Prevention. Results: In a total of 411 MT infection cases, the cumulative incidence rate was 0.08/100,000 populations. Men were slightly more infected by MT as compared to women (51.3% vs. 48.7%), and a higher incidence of MT was observed in people aged over 40 years (93.4%; P < 0.01). The seasonal pattern of outbreaks revealed that most infections occurred from October to November (69.1% of the total cases) (P < 0.01). Significantly more outbreaks occurred in the southern part (53.5%) of the Korean peninsula as compared to its northern (33.3%) and central (10.7%) parts, as well as the Jeju Island (1.0%) (P < 0.01). In addition, the number of MT infections was significantly higher in rural and sea-village (87.6%) than in urban areas (12.4%; P < 0.01). Conclusion: In conclusion, the rapid reemergence of MT outbreaks can be minimized through health education, and a strong enforcement of control measures against rats and their ectoparasites could markedly reduce the transmission of this infection to humans in high-risk areas. Background: Developing countries like India are heavily burdened with multidrug resistant tuberculosis (MDR-TB). Materials and Methods: A retrospective study was carried out at the directly observed treatment short course chemotherapy plus site in our tertiary care center (All India Institute of Medical Sciences, New Delhi) where records of all patients enrolled between 2009 and 2013 were reviewed. The aim of this study was to calculate the frequency of predefined outcomes in these patients receiving standardized treatment for MDR-TB. Results: Out of a total of 819 patients, the frequency of outcomes in these patients was as follows: Cured (n = 415, 52%), default (n = 199, 24%), death (n = 130, 16%), switched to category V (n = 27, 3%), transferred out (n = 12, 1%), treatment failure (n = 13, 1%), and treatment completed (n = 23, 3%). Conclusion: The modest cure rate in concordance with other Indian studies highlights the need for continuing efforts to fight the menace of MDR-TB. Background/Purpose: Most community-acquired urinary tract infections (UTIs) are usually treated empirically. The knowledge of antibiotic resistance patterns of the microorganisms causing UTI is essential for defining the empirical treatment. Objective: The aim of the present study is to determine the distribution of bacterial strains isolated from lower UTIs and their resistance patterns against commonly used antimicrobial agents and treatment results in female patients. 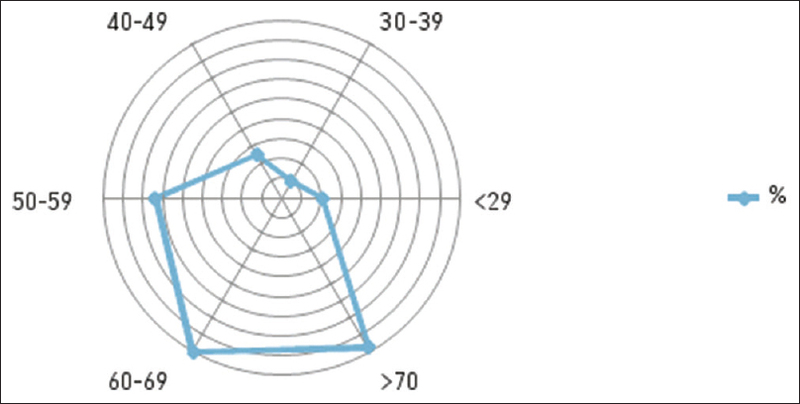 Subjects and Methods: This is a retrospective analysis of medical case records of 90 female patients with lower UTI for a period of 4 years from January 2013 to December 2016 in a tertiary care hospital in the Trakya region of Turkey. Results: The most common causative agent was Escherichia coli (66.6% of cases) followed by Klebsiella pneumoniae (16.6%). Fosfomycin was the most active agent against E. coli (resistant isolates: 5.5%), followed by nitrofurantoin (resistant isolates: 7.4%). Extended-spectrum beta-lactamases (ESBLs) production was observed in 29 (32.2%) isolates (22 in E. coli, 6 in K. pneumoniae, and 1 in Enterobacter spp.). The antimicrobial resistance rates among ESBL-producing E. coli isolates for trimethoprim-sulfamethoxazole, ciprofloxacin, fosfomycin, and nitrofurantoin were 77.7%, 72.7%, 13.6%, and 18.2%, respectively (P < 0.05). The estimated microbiological eradication rates for nitrofurantoin and fosfomycin were 89.7% and 83.8%, respectively. Conclusions: The results of the present study indicate that nitrofurantoin and fosfomycin may be considered for empirical therapy of lower UTIs in Trakya region of Turkey. Objectives: Detection and comparison of metallo-β-lactamase (MBL) production in clinical isolates by phenotypic and genotypic measures. The objective of this study is to evaluate clinical characteristics and risk factors in patients infected with MBLs. Materials and Methods: Study was conducted by the Department of Microbiology, Jawaharlal Nehru Medical College from February 2014 to December 2015. Bacterial culture, identification, and antibiotic susceptibility were carried out according to standard guidelines. MBL production was detected both phenotypically (Modified Hodge test [MHT], imipenem-ethylene diamine tetraacetic acid double disk potentiation test [IMP-EDTA DDPT], IMP-EDTA combined disk synergy test [IMP-EDTA CDST]), and genotypically (bla NDM-1, bla VIM and bla IMP). Results: Among 116 carbapenem-resistant Gram-negative Bacilli (CRGNB), Citrobacter species 28 (24.1%) was the most common pathogen. Phenotypically, MHT, IMP-EDTA DDPT, and IMP-EDTA CDST detected MBL production in 105 (90.5%), 96 (81%), and 87 (75%) CRGNB, respectively. Bla NDM-1 genes were detected in 6 6 (56.8%) isolates, however, very few bla VIM (16, 15.2%) and bla IMP (1, 1.2%) were identified. Considering polymerase chain reaction (PCR) as the gold standard, it was observed that IMP-EDTA CDST was most specific (78.3%) while MHT was most sensitive (97.4%). 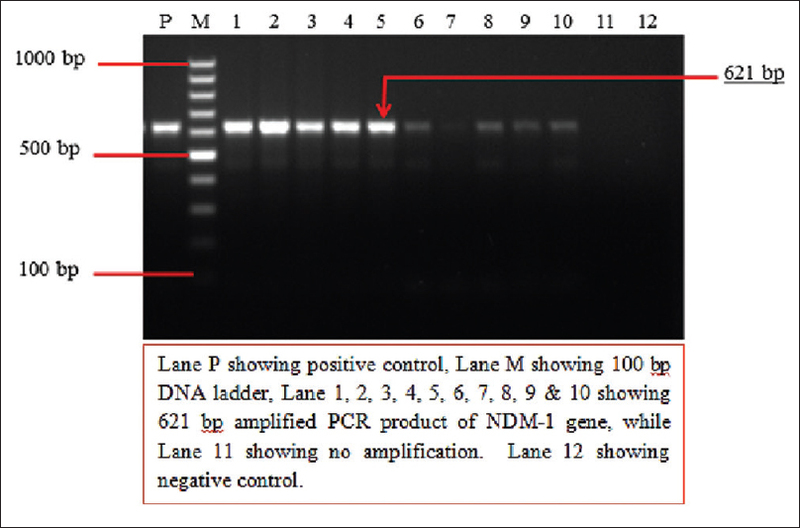 Results of bla NDM-1 gene by PCR were further confirmed by sequencing (Triyat genomics, Nagpur). All the 11 representative strains were confirmed to be NDM-1 gene. Major risk factors in patients infected with MBLs were in-dwelling devices (68%), prolonged hospital stay (72%) and prior antibiotic treatment (86%). However, on tracing their outcome, it was interesting to note that mortality was relatively low 5 (4.3%). Conclusion: The present study shows a rising trend of bla NDM-1 in CRGNB, an ominous sign heralding the post antibiotic era. It is essential to assess the prevalence of various MBLs so that infection control measures can be reinforced. We recommend three phenotypic tests in tandem for the detection of MBL. While phenotypic tests are easy and cost-effective to perform, quick, effective molecular diagnostic techniques can tailor treatment guidelines to optimize patient's management. Background and Objectives: Discovered in 1983, Extended spectrum beta-lactamase (ESBL) producers are still the leading cause of infections in India. Its prompt detection is crucial to the clinical management. The Clinical Laboratory Standards Institute (CLSI) recommends phenotypic screening and confirmatory tests to identify the ESBL producer making it cost and time consuming for the diagnostic laboratory. We compare here the screening and confirmatory tests offering a solution to the CLSI recommendation. Methods: Nosocomial isolates E. coli (71) and K. pneumoniae (25) resistant to cefotaxime and ceftazidime were included. CLSI recommended testing with cefotaxime, ceftazidime and in combination with clavulanic acid by disk diffusion and agar dilution methods were performed. E-test was performed on discrepant results. To determine the genetic relatedness of the organisms, 22 Medical and Surgical ICU isolates were genotyped by PFGE. Dendrogram was constructed using dice co-efficient, UPGMA method with diversity database software. Results and Conclusions: Phenotypic screening disk diffusion test versus the confirmatory agar dilution MIC tests with cefotaxime and ceftazidime correlated well with the final ESBL status (kappa 0.852 and 0.905 P < 0.001) and (kappa 0.911 and 0.822 P < 0.001). The tests show 99-100% sensitivity, 75-83.3% specificity, and positive likelihood ratios between 4.0 -5.9. E-test confirmed 6 of 12 discordant results as ESBLs. Of the 96 nosocomial isolates screened as possible ESBL producers by the Kirby-Bauer disk diffusion test, 86.5% were confirmed ESBL producers. Genotyping on the ICU isolates by PFGE revealed a genetically diverse population suggesting no transmission of phenotypically similar ESBL strains within the ICUs. 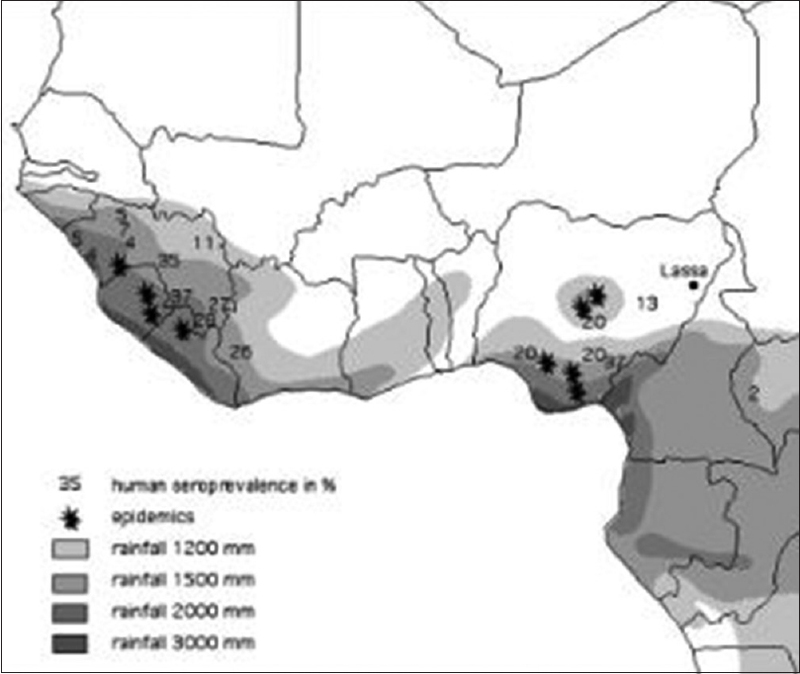 Background: Behavioral and geographical factors may play a role in the acquisition of scrub typhus infection. In this prospective case–control study, we studied the factors associated with infection. Patients and Methods: Consecutive adult patients admitted with scrub typhus infection over 10 months were recruited. For every case, a geographical control from the same area and a gender-matched clinical control admitted with acute febrile illness were enrolled. The risk factors, which included sanitation, environment, activity, and protective measures, were compared between cases and controls using univariable and multivariable conditional logistic regression analysis and expressed as odds ratio (OR) with 95% confidence interval (CI). Results: The study cohort (n = 225; 132 female) aged 44 ± 17 years comprised of 75 cases and 150 controls from mid to low socioeconomic background. When compared with clinical controls, on univariable conditional regression analysis, cases were more likely to be involved in farming or gardening and less likely to have a toilet within the house. On multivariate regression analysis, only involvement in farming or gardening was associated with infection (OR: 4.2, 95% CI: 1.5–11.5). When compared with geographical controls, on univariable conditional regression analysis, cases were less likely to change undergarments or clothes before sleeping (OR: 3.5, 95% CI: 1.3–9.5) and more likely to have rodents in their house (OR: 2.5, 95% CI: 1–6.4) and rest on grass/mud without a mat (OR: 2.4, 95% CI: 1.1–5.3). On multivariate regression analysis, not changing undergarments or clothes tended to be associated with infection (OR: 2.7, 95% CI: 0.98–7.3). Conclusion: Certain behavioral factors predisposed our cohort to develop scrub typhus infection. Lifestyle changes may reduce the burden of scrub typhus in South India. Context: In the face of rising mortality rates from cervical cancer (CC) among women of reproductive age, a nationwide screening program based on visual inspection with acetic acid was introduced in Mozambique in 2009. Objective: The objective of the study is to examine the impact of per capita income on the effectiveness of school-based health education programs to promote the utilization of CC screening services. Materials and Methods: We conducted a cross-sectional study in 2013 involving 105 women randomly selected from households of different economic backgrounds. Marginal effect estimates derived from a logit model were used to explore the patterns in the effectiveness of school-based health education to promote CC screening uptake according to household per capita income, based on purchasing power parity. Results: We found a CC screening uptake of 16.1% (95% confidence interval [CI], 9.7%–24.6%) even though 64.6% (95% CI, 54.2%–74.1%) of women had heard of it. There are important economic differentials in the effectiveness of school-based health education to influence women's decision to receive CC screening. Among women with primary school or less, the probability of accessing CC screening services increases with increasing income (P < 0.05). 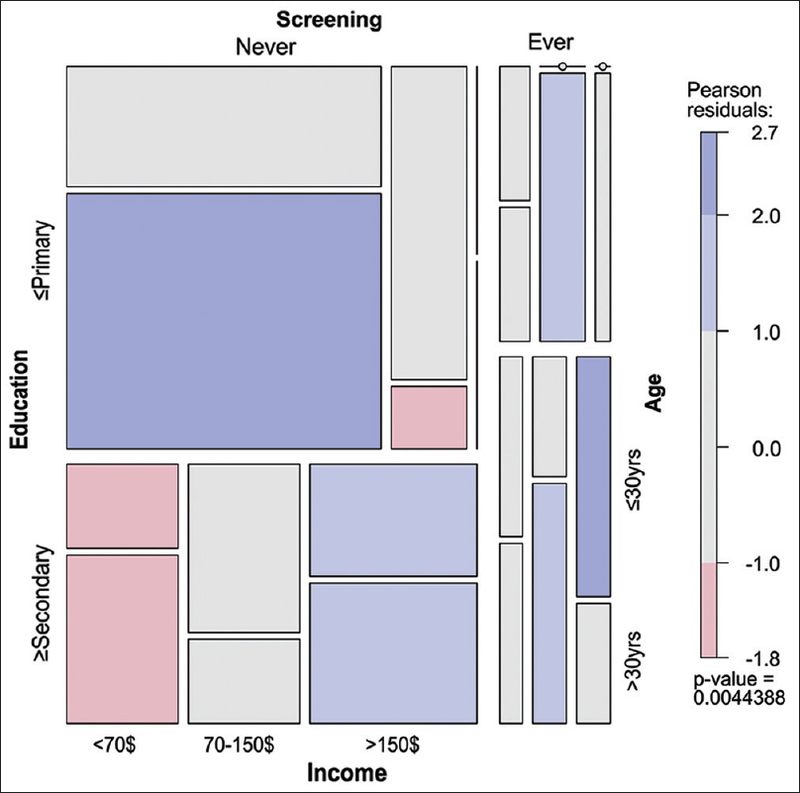 However, income significantly reduces the effect that school-based health education has on the probability of screening uptake among those women with more than 7 years of educational attainment (P = 0.02). Conclusion: These results show that CC screening programs in resource-constrained settings need approaches tailored to different segments of women with respect to education and income to achieve equitable improvement in the levels of screening uptake. Streptococcus pneumoniae is a bacterium responsible for a spectrum of diseases including lobar pneumonia, meningitis, otitis media, and sinusitis. Invasive pneumococcal disease is responsible for significant morbidity and mortality across the world. Concerted efforts led to the development of two vaccinations, Pneumova × 23 and Prevnar 13, for the prevention of pneumococcal disease. The Advisory Committee on Immunization Practices of the US Centers for Disease Control and Prevention provides vaccination schedules for predisposed adults, but the proposed schedules remain a challenge to health-care providers. 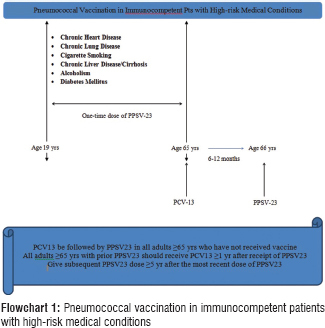 We performed a systematic review in PubMed and these specialty group websites to present the pathophysiology of pneumococcal disease, outline different pneumococcal vaccinations, and condense recommendations for vaccination administration. Candida parapsilosis species complex is considered as important emerging pathogens and little is known about their pathogenicity factors and co-hemolytic activity with different bacteria species. The aim of this study was to determine in vitro exoenzyme activities, biofilm formation, and co-hemolytic effect of different bacteria species on clinical C. parapsilosis complex isolates. 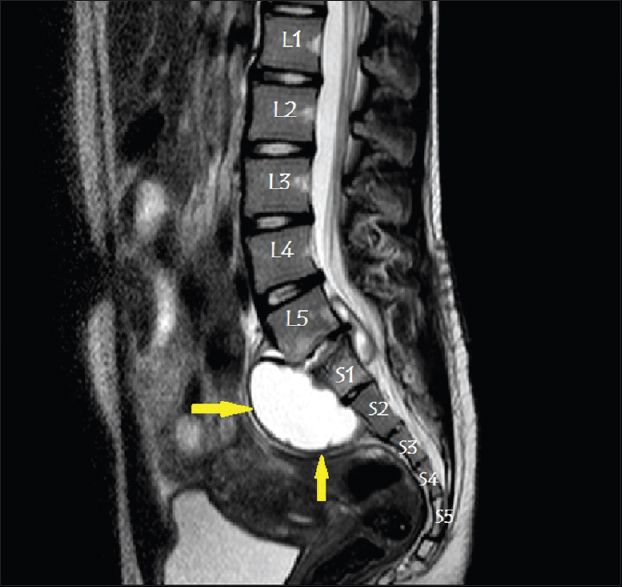 In total, 67 C. parapsilosis complex isolates consist of C. parapsilosis sensu stricto 63/67 and Candida orthopsilosis 4/67 were used in this study. To determine the hemolytic activity of these species, Sabouraud dextrose sheep blood agar was used. Evaluation of the CAMP-like phenomenon carried out in the presence of Staphylococcus aureus, Staphylococcus saprophyticus, Staphylococcus epidermidis, and Streptococcus agalactiae. 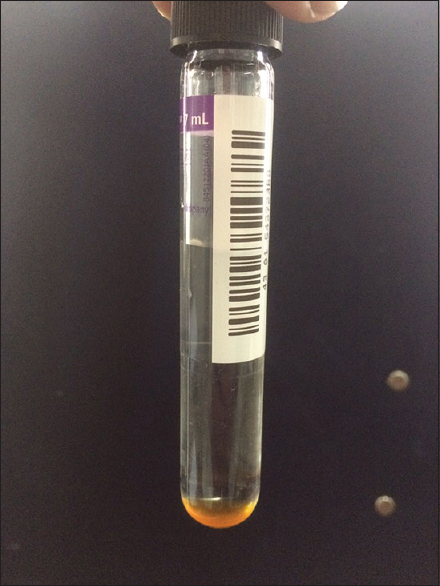 Tube test method with ethylenediaminetetraacetic acid-rabbit plasma was used to determine coagulase activity, and biofilm formation was assessed by the tube method in assist of Sabouraud glucose broth (8%) medium. Fisher's exact tests were used for data statistical analysis. Sixty-six of 67 (98.5%) and 3/67 (4.5%) of the species showed hemolysin and coagulase activity, respectively. Fifty-five of 67 (82.1%) of species had ability for biofilm formation, and none of the samples exhibited co-hemolytic effect in the presence of four mentioned bacteria. No significant difference was found between the level of enzyme production and biofilm formation among the isolates.